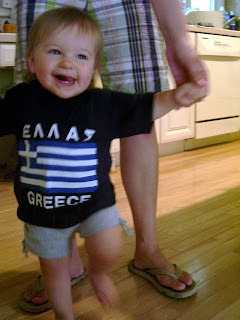 As you can see, I've gotten an early start on trying to awaken a passion for Greek in my little girl. Every time I sing her the English Alphabet I usally compliment it with the Greek and Hebrew alphabets as well. Anyway, I picked this shirt up for her about a year and a half ago when I was traveling through Greece. While she'll surely grow out of the shirt, I'm hoping she grows into a love for learning about Greco-Roman antiquity. Nothing wrong with an early start, I suppose! Great blog, with one exception. Your comment, "I'm hoping she grows into a love for learning about Greco-Roman antiquity. Nothing wrong with an early start, I suppose!" great to hear from you bro. how are you? i didn't know you had a blog. however, i saw that it was "invite only" so, i guessed it was probably family or something. anyway, i hope you're doing well buddy. and don't worry, she'll be reading Barth someday...Aquinas, mmmm, I don't know.